Evergreen trees keep their colors all year long, making these trees every gardener's dream. 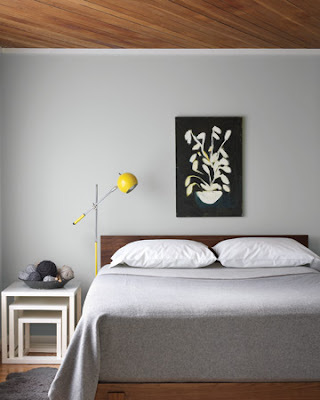 With their long-lasting and visually interesting foliage, the evergreen looks brilliant anywhere within the landscape, especially during the dull gray months of winter. Most evergreen trees require full sun to thrive, so make sure you plant the tree in its preferred growing environment. Nestled along a garden path, used as a makeshift privacy wall or situated within a container, an evergreen provides non-stop beauty to an outdoor space. English laurel provides a makeshift privacy fence along a patio. Perfect spot for dining outdoors or reading the Sunday Times. 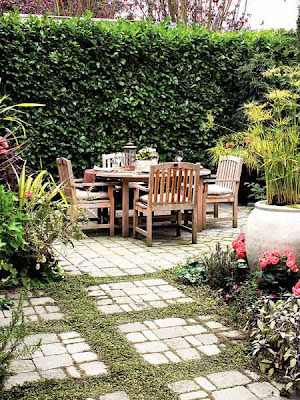 Ficus hedge creates an intimate outdoor living area. Tall evergreens are ideal in long, narrow backyards where you want the patio enveloped by evergreen foliage. 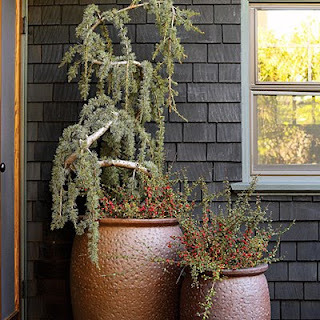 The weeping Atlas cedar is the perfect evergreen tucked into a large container. Fringed with the cotoneaster berries, the winter container creates a perfect balance of color and texture.